however, Organic Avenue is anything but. The environments ooze a chic luxury vegan lifestyle — a re-think only NYC could pull off. With minimal walls, bamboo floors and a spectrum of bold color radiating from juice-filled jars, the result is thoroughly modern. 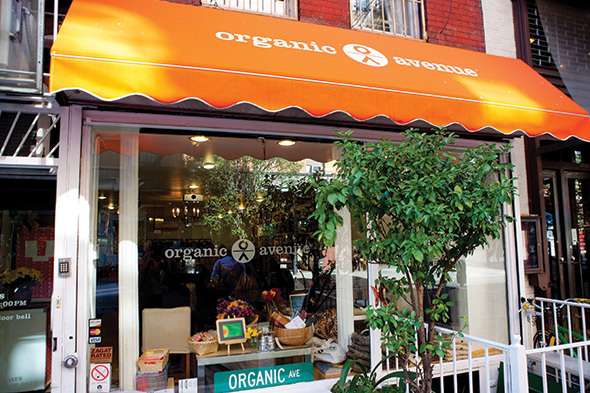 With Organic Avenue’s six locations in Manhattan, it’s likely you’ll see an assortment of model, yoga, dancer or general all-around “it girls” running about the city carrying bright orange bags bearing the mysterious Organic Avenue symbol that resonates as both ancient and contemporary, connecting like-minded people. Celebrities such as Gwyneth Paltrow, Jennifer Aniston, Juliette Lewis and Meg Ryan have been spotted on city outings carrying the über cool Organic Avenue signature recyclable glass flasks. The precious liquid, touted as “candy for the cells,” has even replaced champagne backstage at Fashion Week for many shows. 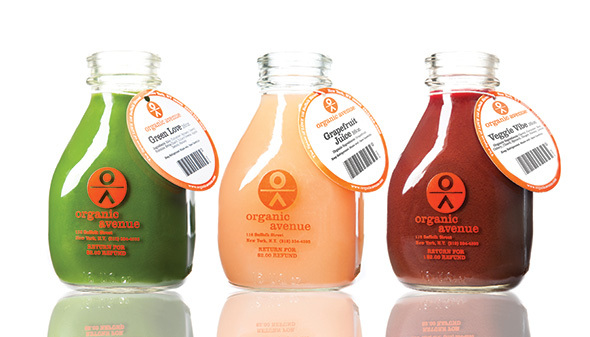 The Norma Kamali Store on 56th Street carries their products, and Organic Avenue provides the juice of choice served in the world renowned Central Park West Jean-Georges restaurant. Organic Avenue is the brainchild of Denise Mari, who has been living the L.O.V.E* lifestyle for over 13 years. She envisioned Organic Avenue as a store, brand and online experience with a community, products, services and support that would make the raw lifestyle accessible. Holding a Master’s in Education, she was a pioneer in the New York City raw scene, setting up a professional-grade kitchen in her home for teaching raw food preparation classes long before “raw” restaurants hit public awareness. “Organic Avenue is my heart and soul’s mission to help people, animals and the environment,” said Mari. juice) and LOVE* Fast — for the advanced (juice with limited raw food). Mari urged, “We must remember it’s the journey, not the destination, and to enjoy the process. And it is a process.” And while Mari is candid regarding the high level of discipline involved in her lifestyle, her sparkling eyes, luminous skin and infectious joy make you an instant believer. I’ll have what she’s having.